It did not happen very often guys that I am so moved by a record that I am urged to write about it and eventually share it with you. But this time it is the case – I stumbled upon an extraordinary piece of recorded music that I would like to inform you about and draw your attention towards it. 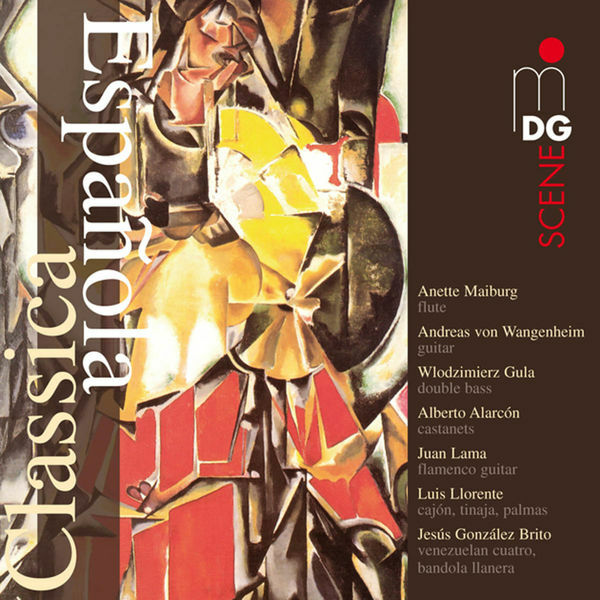 The record I have in mind is called Classica Española and along the works of some of Spain’s most important musicians from the first half of the 20th century Isaac Albeniz, Manuel de Falla and Enrique Granados it comprises also works by contemporary artists like Omar Acosta, Juan Lama and Chick Corea. The red thread that goes through the musical selection is the deeply rooted coexistence of classical and traditional traits presented in the works of the above mentioned Spanish composers. The initiator and main force behind this project is the flutist Anette Maiburg – a rather talented performer capable of crossing the borders of musical genres and styles with ease and virtuosity that are hard to describe. Important part of the album preparation take also the guitarist Andreas von Wangenheim who transcribes Enrique Granados for guitar as well as the arranger Andreas Tarkmann commissioned to arrange Isaac Albeniz for flute, guitar, double bass and castanets. The aforementioned coexistence of classical and traditional traits is reflected also in the selection of the instruments that take part in the recording. Along with the classical music instruments like flute, guitar and double bass the performance includes also flamenco guitar, cajon, venezuelan cuatro, castanets and some even more exotic traditional string and percussion instruments. The instrumental diversity of the album is carried further by the variation in the ensemble’s members quantity for each individual piece, so one could enjoy duo, trio, quartet and so on in a single issue. I should not forget to mention the extraordinary work of the recording engineer Friedrich Wilhelm Rödding – the man behind the materialization of this exemplary performance. Typically for Dabringhaus & Grimm productions this album is a natural recording, which means that it is not performed in a studio but in a natural environment – in this case a hall in the castle Dyck in Rheinland, Germany. This is something one can easily discern by the presence of environment’s acoustic clues and the authentic coherence of the sound images even when listened on a portable player through in-ear headphones. After the musicians have been assigned their proper places in the recording space, the microphones are set up so as to establish a perfect balance between direct sound and room ambiance. All the corrections in fine matters of sound are made with microphones. MDG does not use sound filters or artificial resonance, and it goes without saying that dynamic limiters are taboo. Instead we rely on a carefully selected assortment of professional capacitor microphones representing different sound qualities. For me personally such a recording approach has proven to bring me closer to the performance and the musical content then any other method. According to my tastes this CD is rather successful combination of musical qualities, brilliant performance and recording fidelity. Highly recommended! Thank you for stopping by and always happy listening!